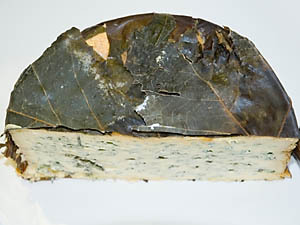 Valdeón Cheese: A soft and creamy blue from the Valdeón valley in northern Spain. Wrapped in some (?) kind of leaves, and made from a combination of cow's and goat's milk, this cheese has a spicy, complex flavour. It's aged, earthy aroma and buttery texture marry perfectly with crisp Asian pear.